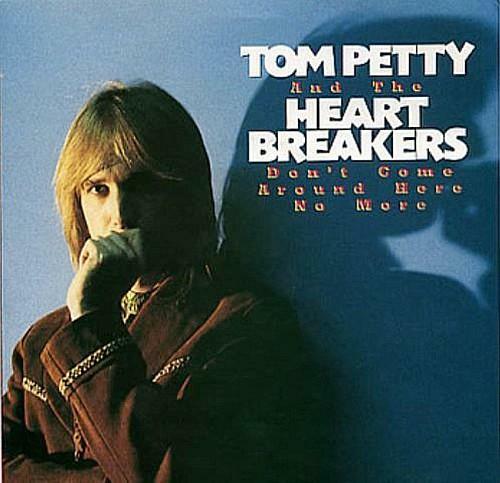 TOM PETTY AND THE HEARTBREAKERS "DON'T COME AROUND HERE NO MORE"
After enjoying two Top 40 hits in the UK during 1977 with "Anything That's Rock 'n' Roll" and "American Girl", Tom Petty and his band failed to have any more chart hits. That is, until 1985, when "Don't Come Around Here No More" reached #50. Now that surprises me, as I certainly remember the song being played quite regularly on the radio, and it has a very memorable chorus. The song deserved to be a top ten hit, at least. Thankfully, the single was a bigger hit in the U.S., where it reached #13. The song was inspired by an encounter Dave Stewart had with Stevie Nicks of Fleetwood Mac. According to the book Conversations With Tom Petty by Paul Zollo, Nicks had just split-up with her boyfriend, The Eagles guitarist Joe Walsh, and at the end of a Eurythmics concert in Los Angeles, invited Stewart to a party at her home. Although he had no idea who she was, he accepted the invitation anyway. While just about everyone at the party was snorting cocaine in the bathroom, Stewart decided to sneak off to bed. He was awoken at 5am by Nicks who was in his room trying on period clothing. He described the situation as like something out of "Alice in Wonderland". Later that morning, Nicks told Walsh "Don't come around here no more". The track was released as the lead single from the album Southern Accents. The B-side featured the track "Trailer". Two more tracks were released as singles from Southern Accents. These were "Make It Better (Forget About Me) and "Rebels", reaching #74 and #54 on the Billboard Hot 100 in the U.S., frespectively. Neither single charted in the UK. The video is pretty bizarre, and that's no surprise as it is based on Alice in Wonderland. At the start, we see Alice (played by the actress Wish Foley) walking through a landscape filled with giant mushrooms. She spots Stewart sat on top of a mushroom smoking through a hookah and playing the sitar. Alice climbs the mushroom stairs toward Stewart who gives her a piece of mushroom (?) to eat. She tumbles backwards and falls into a black and white chequered room. 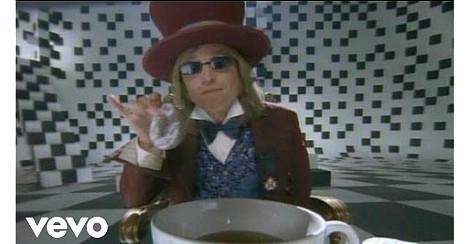 Petty appears as the Mad Hatter sat in an ornamental chair at a long dining table with a giant cup of tea. Alice sits opposite him, and the Mad Hatter sings the song's title to her. At the end of the bizarre tea party, we discover that Alice has turned into a cake and the Mad Hatter cuts slices out of her to hand to his guests and they all consume her.